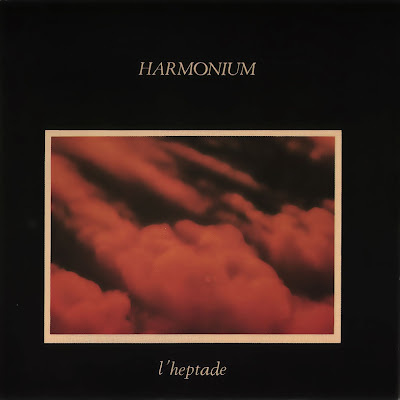 Harmonium's gradual transformation from acoustic folk to symphonic progressive rock was finally and definitively completed on "L'Heptade", a double album of utter musical depth and beauty dealing with the seven levels of consciousness. Fiori's ambitions kept getting bigger with each album and demanded the line-up to change and expand yet again, including now not just a permanent drummer in Denis Farmer, but also guitarist Robert Stanley who made the electric guitar more featured in the sound. His inclusion in the group was needed for other reasons too, as Normandeau actually left the band before the album was finished. The record also included several guest musicians, one of the most important were arranger Neil Chotem who in addition to play various keyboards also conducted the Montreal Symphony Orchestra on several passages during the record. They had also gotten a new wind player in Libert Subirana, as Daigneault decided to leave the band after the previous album. After a lush and moody orchestral prologue, the first song that graces our ears is "Comme un Fou" that has to be one of the best tracks the band recorded. All the new elements of the sound were presented here, and all of them worked as well as they could. The vocal harmonies (consisting both male and female voices) are wonderful, as well as the melodies and the very tasteful and integrated synths which play some of the main themes. You won't find much music that is more thoroughly and beautifully arranged than this. It should also be noted that Normandeau gets writing credits here and on several other tracks, so he were obviously a lot involved in the creation of the record, even if he's not featured on much of it. "Chanson Noire" shows that the more whimsical and light-hearted side of the band could come through even within the very ambitious frames of "L'Heptade". The song itself is far from simple though, featuring several chord changes and subtle symphonic passages with Mellotron. "Le Premier Ciel" has a pretty typical structure for an epic and lengthy progressive rock song, starting quite low-key and mellow before gradually building up the pace and evolving into one of the most infectious melodies on the album. Here the orchestral arrangements also really melt in together with the band, and the track climaxes with a lengthy instrumental part featuring excellent synth-work above an almost funky rhythm. The first part of "L'Exil" is an acoustic ballad where Fiori's emotional and dramatic vocal delivery is not far from Christian De Camps from Ange. The mid-part is a very dreamy and mystical instrumental section featuring nothing else than a drifting synth, taking the listener to a higher level of consciousness. But the track lightens considerably up when the vocals return in the end, before entering a grand and powerful finale. Guest vocalist Estelle St. Croix takes centre stage on "Le Corridor", singing a strong melody over the el-piano. The instrumental part of this song is also dreamy and quiet, but now underpinned by acoustic guitars. The least accessible moment on "L'Heptade" is probably "Lumières de Vie", featuring lots of classical piano and rather dark and subdued vocal parts. But again, also this track gets lighter in the end when the whole band joins in to play the concluding instrumental theme. "Comme un Sage" is a song that stays pretty much the same all the way through, despite the fact that it takes up nearly the entire fourth side of the album. Still, it doesn't become repetitive or boring for a second, but instead just glides gracefully away carried by a lovely melody and Fiori's pleasant vocals. And there are parts where the pace is turned up some levels too, like the one where the wordless vocal harmonies almost seem to be dancing around the band's powerful playing. But it slows down afterward again, just to build up to a striking finale where the beautiful chorus increases in intensity, before the orchestra joins in to top it off at the very end. The whole album is then ended with an orchestral epilogue that ends with the very first chords of the prologue. "L'Heptade" shows that Harmonium probably were the most original progressive rock band from Quèbec, as it won't remind you of any other band. And let's face it, no matter how many superb symphonic progressive rock bands that existed in the 70's, not too many of them were able to create a sound that was completely their own, but that's just what Harmonium did here.